It’s with great excitement and pride that we welcome Russell Volckmann to Allegro 234 as Creative Hub Contributor. Let’s see the results of co-writing in Webjam. The first instrumentalist is Cristian Saracco, editor of The Semantic Branding, where he shares his thoughts and trends about branding and business strategies. Cristian is also Director of Allegro 234 based in Madrid, Spain. The second instrumentalist is Julio Ferro, editor of Hey! It’s About Design and owner of Hey! Brand Design in Buenos Aires, Argentina. They’ve worked together and allowed them to ignite the spark between their two worlds in order to deliver differential solutions to both local and international renowned brands. [C] I would like to humbly begin with a trend which in certain way has some kind of relation with Julios’s previous post: We are facing new ways of recognition and satisfaction, away from well-known trditional status symbols like luxury cars and expensive watches. The issue is to see who spend the most, who lives an unique experience, who has more presence online… And this excitement is not necessarily about traditional consumption patterns, but about status, about impression peers. 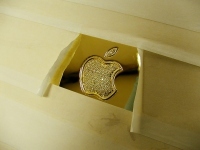 [J] The funny thing is that the word Design is closely associated to luxury goods as well. I mean, they sound like synonyms in the big cities around the world where you can see an incredible show off. A good example is Design Miami/Baselâ„¢. Design for zillionaires. [C] There will be people who will pay â‚¬ 10 toâ‚¬ 350 for a bottle of water… They will show status to their peers because of the experience that they are living with a bottle spotted at the Emmys and MTV Awards. 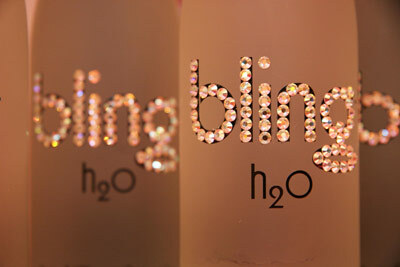 Bling H2O, a fashion accesory. [J] Bling-Bling! And if you don’t have enough glitter, the alternative is to pimp your gadgets. 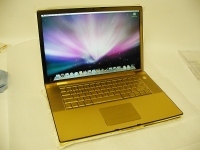 You can give real gold to your iPhone or laptop that coast a fortune. Glitter is part of the environment of (posing) millonaires. Glam is back, but this time is real and worths too much money. [C] It’s water!… It’s a 750 ml bottle embelished with Swaroski crystals… Functionally, we know what it is , emotionally, “a bottle that tells a lot about the person who is drinking from it”…. And behind the scene, another two big factor: It’s telling us a reality, it’s transparent, it’s telling us a story, “it’s not waht you have, it’s the experience you live”. [J] Crystal clear. There’s a new sense and It’s a review over a traditional atribute of waters. I see coincidences between waters and parfumes. 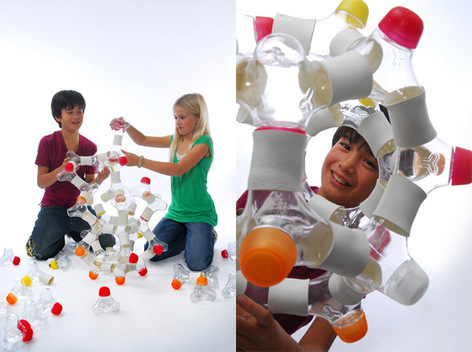 And several coincidences between the experience looking at their bottle designs. 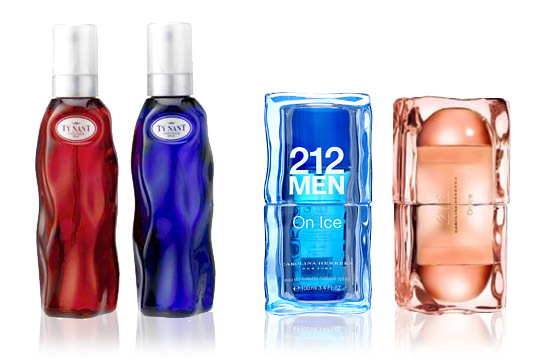 May I either drink Carolina Herrera or spray my face with Ty Nant? There’s also Kenzo water. Any ressemblance with Voss is “pure” coincidence. [J] Going back to your comment about new ways of recognition I see really interesting the new design directions for such a basic product. 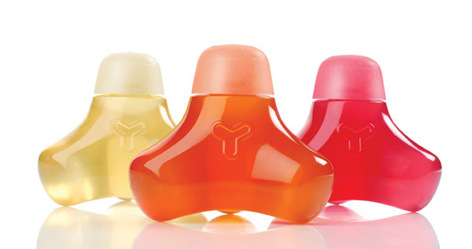 Y Water has an amazing bottle designed by Yves Behar (One Laptop Per Child designer). It’s a “smart water” where form and content work really well IMHO.